Jobs saw Wozniak’s invention and saw opportunity. To them the idea of building and selling personal computers was a compelling one, but to most people at the time it was ridiculous concept. Wozniak was so passionate and committed that he dropped out of University of California in Berkeley to focus on their shared vision and passion. In January 3, 1977 they were officially incorporated as Apple Computer Inc. Stephen and Steve worked out of Jobs’ garage. They toiled together to bring the Apple 1, and sold them at $666 dollars each. The Apple 1 actually had been designed over a period of years by Stephen Wozniak and was similar to the first commercially available computer – the Altair 8800. It was developed for computer hobbyists and was a simple machine. The strategy development and planning process can be tide to review previous targets, identify key reasons for gaps, and to set new performance goals. A key is to pay the price to develop sound performance indicators, to monitor progress regularly and to continually address issues so that the targets can be achieved. Internal and external indicators should be in place. Internal indicators help to monitor those critical activities needed to achieve the targets. External indicators monitor factors outside of your organization that could impact your short and long-term goals. The ideal is to find factors that provide you the greatest lead time and are most reliable. Passion and sweat was put into the Apple II. Stephen and Steve needed and wanted to make a splash. They redesigned the TV interface computer, included graphics and eventually color. They improved the case and the keyboard. It was designed so that that the computer was ready to run out of the box. They debuted the computer at the West Coast Computer Fair on April 16, 1976. Sales for 1977 totaled $774K. Apple Computer Inc. focused on creating the Apple III to compete with IBM and Microsoft in the business arena. In 1980 it was introduced. It included software and was higher priced. Unfortunately, it had stability issues and was recalled, and then reintroduced in the fall of 1981. This product was not successful. After the Apple III, the company focused on a new product they called “Lisa.” It included a hand-held mouse and a GUI. The product was priced too high keeping it from selling well. Apple focused on creating a culture that supported innovation, and focused on developing a new computer – the MacIntosh (Mac). It was released in 1984. It included graphics, and Mac OS that could run on all of the Apple computers, was user friendly, and sold at a lower price. It was projected that 80,000 units would sell, but only 20,000 did. Businesses where hesitant to buy the Mac because of its incompatibility with IBM PCs. Apple introduced the LaserWriter printer, and PageMaker a desktop publishing application. These unique additions plus the Mac’s graphics capabilities helped to create the desktop publishing market. John Sculley was president of PepsiCo. He was known for his marketing skills. For instance, he introduced “the Pepsi Challenge” which resulted in PepsiCo gaining market share. In 1983, he was hired as CEO of Apple. Jobs then founded NeXT, a firm that built computer workstations for the higher education and business markets. In 1988, the firm introduced the NeXT workstations. They were described as “interpersonal” computers implying that they were a step beyond the “personal” computers. The NeXT workstation was technologically advanced. Thus, the target markets were the scientific communities. Since the cost of the workstations were high, sales were disappointing. However, those that did purchase the workstations were passionate about them. NeXT moved into the software development world and released NeXTSTEP in 1989. It was an object-oriented, multitasking operating system that ran on NeXT computers. Examples of the advanced features it provided included are: considerable power to develop software; refined user interfaces; GUI concepts not common in other operating systems; drap and drop of objects beyond file icons; real-time scrolling and window dragging; interfaces to manage publishing color stands; sophisticated sound processing; internationalization; modern typography. From 1986 to 1993, key products that Apple released included the Macintosh computers, portables, powerbooks and workgroup servers. Skulley focused on mass marketing and sales increased from $800 million to $8 billion. It seemed that nothing could go wrong for Apple. Apple started to move away from their core strengths. John Sculley began to create too many categories of products that lead to confusion. Each product model had a different name targeted for different markets (e.g., home, education, and business). Buyers were confused. There were eventually incompatibilities between various models. Trying to keep the operating system compatible across the models was daunting. Apple also focused on cameras, CD players, TVs, speakers and other non-computer related products. In 1993, John Sculley was let go. Michael Spindler was promoted to CEO in 1993. He had played a key role in helping Apple to grew quickly in Europe. He was a brilliant strategist. He launched several successful projects that turned out to be successful (e.g. PowerPC) but also had some big failures. While Spindler was a great strategist, he wasn’t as gifted at translating his strategies into concrete plans and struggled with stress. He held discussions with IBM and others about takeover options, and when these didn’t materialize, he was let go. Amelio reduced the workforce by 1/3, and focused on the development of the Mac OS 8. Apple still needed a viable next generation operating system. He launched talks to purchase BeOS but they never reached an agreement. Ultimately, Amelio started discussions with Steve Jobs about NeXT and in 1997 bought the firm for $429 million. November 1997 - Jobs introduces a new line of Macintosh computers called G3, and a website that lets people order directly from Apple. 1998 – Apple unveils the iMac desktop computer. 2001 - Apple opens its first retail store. 2001 - Apple introduces the iPod, a palm-sized, hard-drive-based digital music player. 2003 – The iTunes Store opens, allowing users to buy and download music, audiobooks, movies and TV shows online. August 2004 – Jobs announces he underwent successful surgery to remove a cancerous tumor from his pancreas. The rare form of cancer is highly treatable. 2005 – The iPod adds video, and Apple fills out its portable media line with the low-end iPod shuffle, and sleek iPod nano. October 2005 – Tim Cook is named Apple’s chief operating officer, after serving as executive vice president of worldwide sales and operations since 2002. January 2007 - Apple announces the iPhone. The device features one button on its smooth face and a virtual keyboard. It also introduces Apple TV, which attracts few buyers. September 2007 - Apple unveils the iPod Touch — essentially an iPhone without the phone — which has wireless capabilities and performs much like a portable computer. 2008 - Apple opens its App Store as an update to iTunes. The store features small applications — from games to social and business tools — that add functions to the iPhone and iPod Touch. Apple also releases the MacBook Air. January 2009 – Jobs takes leave for health reasons. COO Cook leads the company in the interim. June 2009 - Jobs returns to the company after undergoing a liver transplant. 2009 - Apple releases the iPhone 3GS. The company has sold more than 220 million iPods so far. 2010 – Apple awards Cook a bonus valued at $22 million for leading the company during Jobs’ sixth-month leave, during which its shares soared about 70 percent. April 2010 - Apple begins selling the iPad, a 10-inch touchscreen tablet, and has an 84 percent share of the tablet market by year’s end. Researcher iSuppli estimates 12.9 million iPads were shipped as of December 10. November 2010 - The Beatles’ 13 albums become available on iTunes, ending years of talks between Jobs, Beatles’ management company Apple Corps and Beatles label EMI Group. 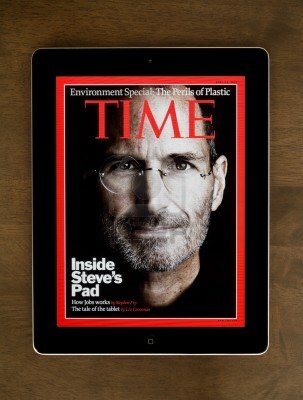 January 17, 2011 - Jobs announces that he will take another medical leave. February 10, 2011 - Verizon Wireless, a venture of Verizon Communications Inc and Vodafone Group Plc, starts selling the iPhone in stores and puts an end to AT&T’s exclusive contract for the phone in the United States. February 15, 2011 - Apple launches a long-awaited subscription service for magazines, newspapers, videos and music — a move that could hurt streaming services Netflix and Hulu.